BlueBrick is a terrific open source software tool for designing Lego® based layouts. This tool allows you to arrange baseplates, track, and other items into desired layout configuration. You can assign different drawing layers for each item, generate parts lists, add text annotations, and much more. BlueBrick comes pre-installed with many different parts libraries, including Lego® track from the 4.5V era up to current 9V/RC track. 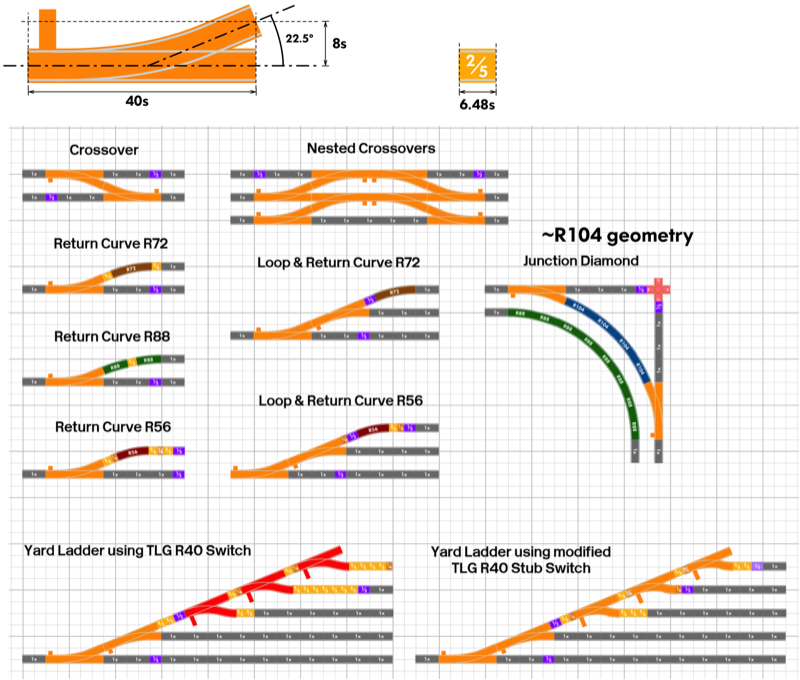 Since the introduction of new alternative track items from ME Models, we can now build layouts with new curve radii options of 56, 72, 88, and 104 studs. I have created two BlueBrick compatible libraries to assist with train layout planning by expanding the range of elements available for design. ME Models Track Components - This can be used as an expansion pack for the existing BlueBrick Track parts library. Simply extract the downloaded archive into the pre-existing \parts\Track folder. 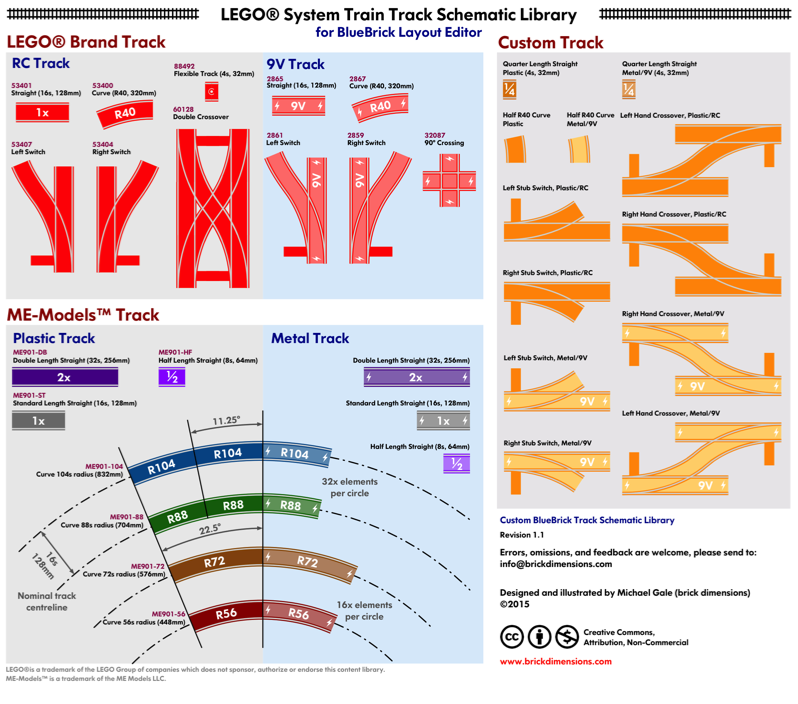 Complete LEGO® Train System Schematic Elements - This is completely new library developed specifically for symbolic or schematic track planning. It is a complete library including track elements from LEGO®, ME-Models, as well as custom track elements such as stub-switches and crossovers. 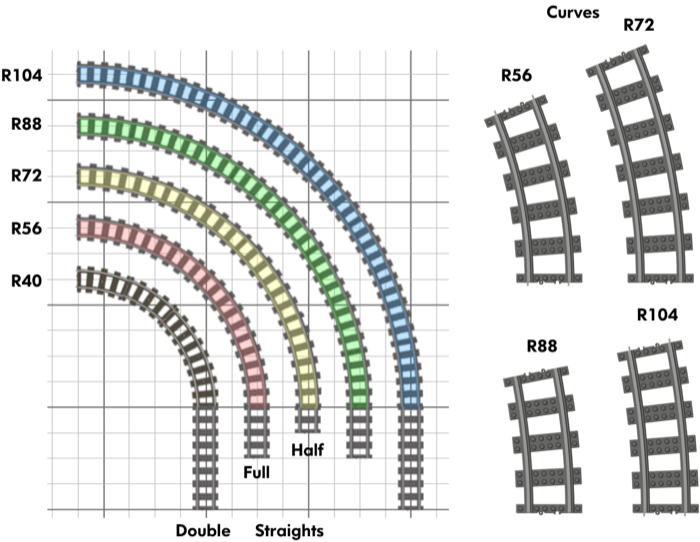 This library contains ME-Models track components for straights (half, full, double) and curves (R56, R72, R88, R104). This library can be installed into the existing BlueBrick ..\parts\Track folder or you can create a new folder under ..\parts\ and extract the zip there to create a separate parts category. Download one or more library zip files using the links above. Copy and unzip the METrack.zip file to the BlueBrick library folder for track components, e.g. ..\BlueBrick 1.8.0\parts\Track depending on your installation. Launch BlueBrick and verify that the new track components are in the "Track" section of the library selection window. Launch BlueBrick and verify that the new track components are contained in a new category with the same name as the sub-folder you created, e.g. "Track Schematic"
In addition to capturing current track products for layout planning, I have designed conceptual custom track elements. These elements are almost a "wish list" for alternative track products. I believe these elements would greatly expand the range of potential LEGO® track layouts and offer more prototypical looking track configurations. When designing this switch, it became apparent that the 16-stud convention and 22.5º sector angles do not overlap well from a geometry point of view. Designing a switch to make a clean crossover was easy, designing it to support a return curve was not. It turns out that in addition to the switch itself, a new straight track element is required to realign the geometry of return curves back to nominal 8-stud interval grid. After some analysis of various track configurations, a "2/5 Straight" or "6.5-stud Straight" element was required. In actual fact it is 6.48x studs long for minimal alignment error; however, even at 6.5x it is within the mechanical tolerances of the track construction. This element is very nearly a familiar ratio of 2/5 which we use for SNOT building techniques. It is in fact a partial ratio of the standard 16-stud straight, i.e. 2/5 x 16 studs = 6.5 studs. This new straight element makes possible a variety of return curve configurations with several standard (R56, R72, R88) radii as well as providing alignment for stacked yard ladders. In future, I intend to design a so-called "Long" switch which has a diverging route at 11.25º. I haven't worked out all of the geometry; however, I am hoping it will fit within the "system" similar to the "Medium" switch. This library is intended to be an extension to the existing Schematic track planning elements shown above. To install it, unzip the library into the existing Schematic track planning elements folder.